Who doesn't love candy? Whether it's enjoying a candy bar at the movies or sharing one with friends and family, candy is a delicious treat almost everyone enjoys. Candy lovers in the U.S. spend over seven billion dollars each year. There are so many types of candy bars to choose from and several are top sellers. Snickers is not only best-selling candy bar in the U.S., it's also the best-selling worldwide. The Snickers bar, made by Mars Inc., was named after the Mars family's favorite horse. Snickers is a mixture of peanuts, caramel and nougat wrapped inside a layer of chocolate. It also comes with hazelnuts and almonds instead of peanuts, and a crisper and peanut butter crisper version. The heavenly pairing of peanut butter and chocolate that is the Reeses Peanut Butter Cup is the second highest selling candy bar in the U.S. It also is the highest-selling candy bar at Halloween. Even better, they're also gluten-free! The triangular shaped Toblerone is the second-highest selling candy bar worldwide. 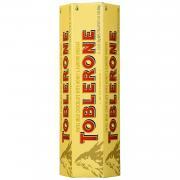 Toblerone was created in Switzerland in 1908 by the Tobler family. It's a combination of milk chocolate, honey and nougat. If you prefer some variety, you can also get Toblerone bars made with dark chocolate or white chocolate, as well as a variety with raisins included in the mix. Kit Kat comes in fourth place for top selling candies in the U.S. 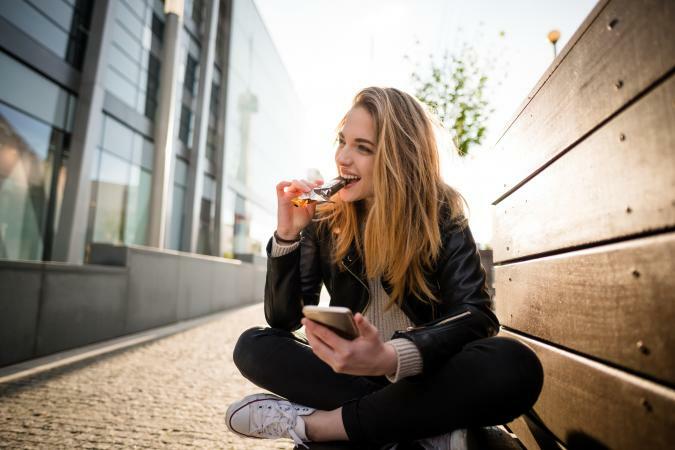 Kit Kat is actually the first candy bar that used the concept of "sharing" in a marketing campaign, which is still continued in present-day campaigns to the delight of anyone sitting next to a friend eating a Kit Kat bar. In fact, Time Magazine named Kit Kats the "most influential candy bar" of all time. Kit Kats are layers of chocolate and wafers and come in the traditional milk chocolate version as well as ones with white chocolate and dark chocolate. For some truly unique Kit Kat versions, you can find them in ginger ale, watermelon and salt, and wasabi versions in Japan. According to Bloomberg, Dove is the third highest selling candy bar globally. Although it's known as a Dove bar in the U.S., the candy bar's name outside of America is the Galaxy bar. The Dove/Galaxy bar is primarily a smooth chocolate bar made with milk or dark chocolate, with a dark chocolate version containing almonds. 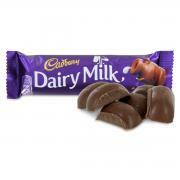 The number-one candy bar in the United Kingdom is the Cadbury Dairy Milk. The bar is made of solid milk chocolate and also comes in a caramel, fruit and nut, whole nut and Oreo version. Even though Cadbury is owned by U.S. manufacturer Hershey, the U.K. versions are made in the U.K. and the U.S. versions are produced in the United States. This leads to a slightly different flavor for each that has British and American Cadbury lovers at odds with each other over which is the best. The Twix bar is an enticing combination of chocolate, caramel and cookie and is one of the top ten best-selling candies in the United States. It also comes in a peanut butter and a dark chocolate version. Twix has the distinction of also being the first candy to top a donut at 7-Eleven stores nationwide. Milka bars are the top selling candy bar in Germany, totalling over 730 million a year in sales. It also has a significant percentage of the chocolate bar sales in France. Milka bars are solid bars of milk chocolate known for their rich, creamy taste. Manufactured by Mars Inc., the 3 Musketeers bar is in the top ten of worldwide candy bar sales. It also comes with a mint-flavored nougat version. The 3 Musketeers is filled with a flavored nougat center and covered with chocolate. 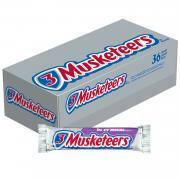 For people who live outside of the U.S., the 3 Musketeers is known as a Milky Way bar, though there is a U.S. Milky Way bar that has nougat and is slightly different from the 3 Musketeers. Another top-ten seller, the Hershey Bar, is almost 200 years old! It was first manufactured in 1900 and was called "The Great American Chocolate Bar" by its creator, Milton Hershey. Milton's creation revolutionized chocolate in the U.S. because his method of cheaply run mass-production made a high quality chocolate affordable to anyone and not just the wealthy. Hershey's chocolate bars are also an important ingredient in everyone's favorite campfire treat, Smores.